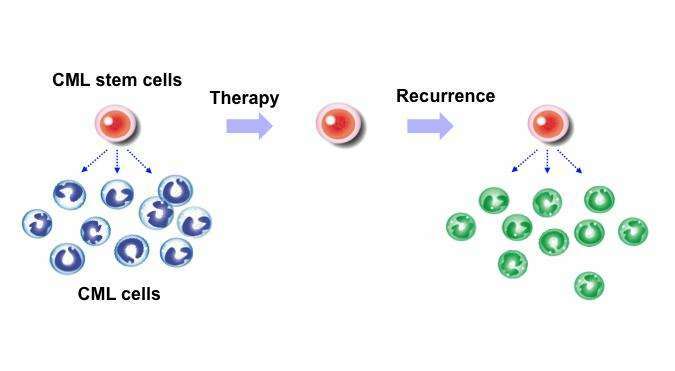 A research group in Japan and in Korea has found a novel nutrient uptake process that maintains the activity of murine chronic myelogenous leukemia (CML) stem cells. Pharmacological inhibition of nutrient uptake decreased CML stem cell activity in vivo. Based on a report published on August 20, 2015 in Nature Communications, it has been established that certain nutrients support CML stem cell activity in vivo, thus pointing towards a potential therapeutic target for CML therapy. CML stem cells, the cellular source of a vast majority of CML cells, are reportedly responsible for the recurrence of CML, following the currently used tyrosine-kinase inhibitor (TKI) therapy. "Although TKIs such as the first-generation TKI imatinib mesylate (IM) and the second-generation TKIs dasatinib and nilotinib have markedly improved the prognosis of patients with chronic phase CML, a cure remains elusive. To completely eradicate CML stem cells and CML, TKIs may have to be coupled with novel therapeutics targeting alternative mechanisms." said Dr. Kazuhito Naka, an associate professor at Hiroshima University, Japan. Dr. Naka, Prof. Yoshihiro Takihara (Hiroshima University, Japan), and an international group of researchers including Prof. Seong-Jin Kim (CHA University, Korea) and Prof. Yukio Kato (Kanazawa University, Japan) have surveyed metabolites specific to CML stem cells, isolated from a mouse model of CML. Researchers found that CML stem cells accumulate significantly higher levels of certain dipeptide species than do normal hematopoietic stem cells. Once internalized, these dipeptide species act as nutrients for the CML stem cells and play a role in CML stem cell maintenance. Importantly, an inhibitor of the dipeptide uptake blocks CML stem cell activity in mice. 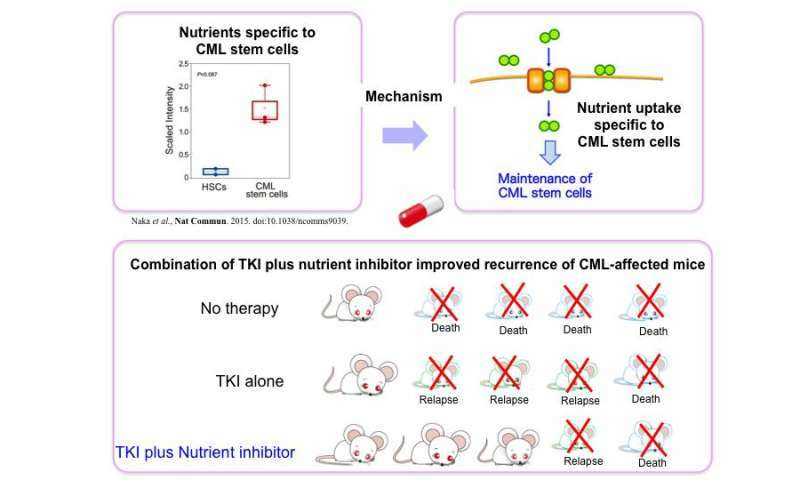 "Our proposed approach of using inhibitors to shut down a key nutrient uptake process specific to CML stem cells, in combination with TKI therapy, may thus provide concrete therapeutic benefits to patients with CML. It will open up a novel avenue for curative CML therapy." Dr. Naka explained.